number one answer: our new visitors decided to drop in and check us out after driving by. That’s cool to know. But it’s also pretty amazing for two reasons. Reason #1: current wisdom is that new visitors spend up to a year checking out congregations online (web site, Facebook, even Yelp reviews) before they ever set foot in the place. What our new visitors are reporting seems to buck this trend. noticed that we don’t say anything that tells people what time or day we meet? In my Christmas Eve sermon, I told the story of multiple strangers who have contacted us over the past couple of month to share their appreciation for the signs we have put out on Tices Lane. Not the big blue one. 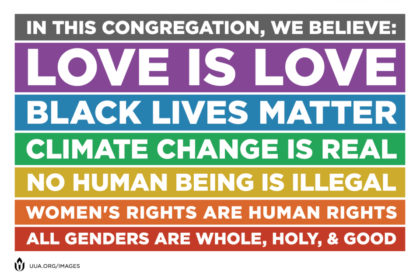 The ones with the affirming message that convey our Unitarian Universalist values. Originally, we had two yard signs along Tices (and there’s the one close to our building entrance), but one from along the road was stolen. You can see at the bottom of this page what they say – they’re small and are hard to read unless you are up close. 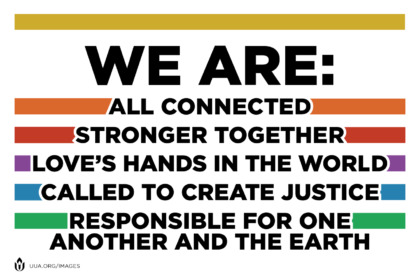 Our values matter to us. And, it turns out, they matter to others in the wider community. 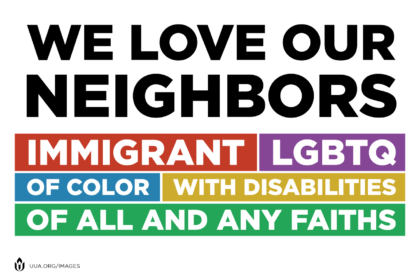 It is a positive thing that we put out an affirming message in a public place – that we make our values and ourselves more visible. For us and for others out there waiting to hear just this message. I wonder if the new year that is upon us might bring opportunities for us to choose to be more visible, to make our values and our message more widely available? It can happen, but it won’t do it on its own. It’s really up to us to make it happen.